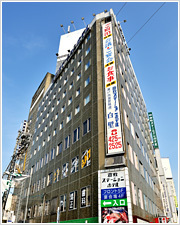 The station complex houses a large department store selling items including specialty goods from Okayama and Kurashiki. The Kurashiki Bikan historical quarter is home to vendors of Kurashiki’s own Japanese-style confectionary, folkcraft stores selling goods including eco-friendly bags, art galleries, and cultural facilities. 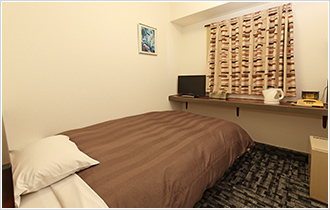 A hotel offering friendly service and a relaxing atmosphere. Located on the basement level of the hotel is the seafood restaurant Shirakabe. The restaurant features a large holding tank for seafood freshly caught in the waters of Japan’s Inland Sea, prepared and served to diners in a range of delicious, healthy dishes. 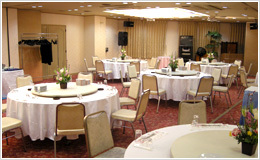 There is also a reception hall with capacity for 150 guests. 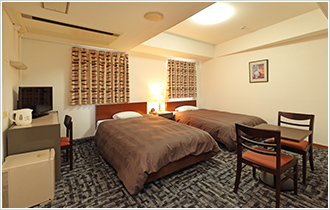 The hotel does not have non-smoking rooms, but we can use a deodorizer on your room before you arrive. Please contact us in advance if you would like your room deodorized. Please pay in Japanese yen cash or by credit card when checking in. *China UnionPay is also accepted. Offering guests the highest-grade Japanese cuisine making extensive use of fresh seafood from the Inland Sea. 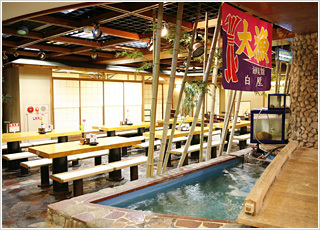 The restaurant’s Japanese-style interior features a large seafood holding tank. Rated highly by visitors to Japan from all over the world. Open for lunch: 11:00 a.m. to 2:00 p.m.
Open for dinner: 5:00 p.m. to 10:00 p.m. This hall can cater for anything from small groups to receptions of up to 150 people. Japanese-style dishes using the best in-season produce are served in a spacious setting. The Kurashiki Bikan historical quarter is a picturesque district that has retained much of the charm of the feudal Edo era. Guests can enjoy the townscape, with its characteristic whitewashed walls, from on board one of the boats that cruises the Kurashiki-gawa River flowing through the district. "At night, special illumination lends the district a magical atmosphere. Turn down any laneway and you will find a range of charming stores and elegant dining venues. There are also many notable cultural destinations, including the Ohara Museum of Art, home to many works of international significance." 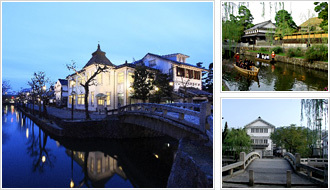 Take the time to stroll around and enjoy all that Kurashiki has to offer. Among the items exhibited here are important works by artists such as El Greco, Gauguin, Monet and Picasso. and some attractions may not be in operation all year round. 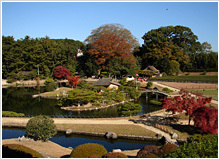 "Okayama Korakuen is known as one of Japan’s top three parks. 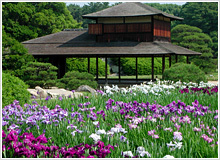 Its vast Japanese-style garden was constructed 300 years ago. " 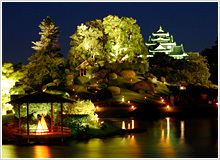 Each new season brings a different mood to the park, which also offers views of Okayama Castle. March 3 is the Dolls’ Festival in Japan, when people display Hina dolls and pray for the well-being of female children. Around the time of this festival, the Kurashiki Bikan historical quarter, shopping precincts and other parts of Kurashiki City are dotted with countless displays of Hina dolls. Hanami is the Japanese tradition of welcoming spring by gathering to enjoy the cherry blossoms that appear all over the country from March through April. The Kurashiki Bikan historical quarter and Okayama’s Korakuen Park are just two of the sites where visitors can savor vistas of the cherry blossom, Japan’s national floral emblem. Kurashiki plays host to a musical event spanning a variety of genres. This festival features a diverse and extensive program of events showcasing Kurashiki’s inimitable charms, including a spectacular street parade, concerts, and river cruises. 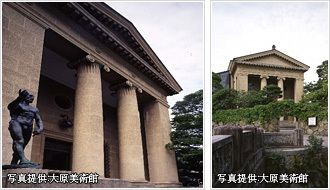 Venues include the Bikan historical quarter and cultural facilities across the city. Kurashiki’s annual summer festival is celebrated in style with parades, dancing and other attractions. Visitors also flock to the many night stalls operating during the festival. The streets of Okayama City are brought to life through dance during this classic summer festival. Visitors can enjoy a fireworks display, as well as many dancing parades featuring ogre motifs from the Japanese fairytale Momotaro, the Peach Boy. The annual festival for Kurashiki’s Achi-jinja Shrine. A humorous event in which participants dress up in masks of old men and women.